1) Credit Program (CP) informational meeting will be held on next Sunday, 3/27, 12 noon - 1:00 pm, in PTA room, F-209. Parents, if you have student going to be enrolled in credit class in year 2016-2017, you are highly recommended to attend the meeting. Students who will be in 7th grade at public school in 2016-2017 are eligible to take credit class. Placement test is scheduled on 4/24. Please plan ahead. 2) Regular Program Reading Contest is on this Sunday. Detailed schedules have been sent to all teachers. Contestants please arrive on time. 3) Passport pick up. 12 noon in the office. Next visa service is April 3. Please plan ahead of time. 4) HOC Essay Contest deadline 4/4 is coming! All students are highly encouraged to participate in this annual contest. 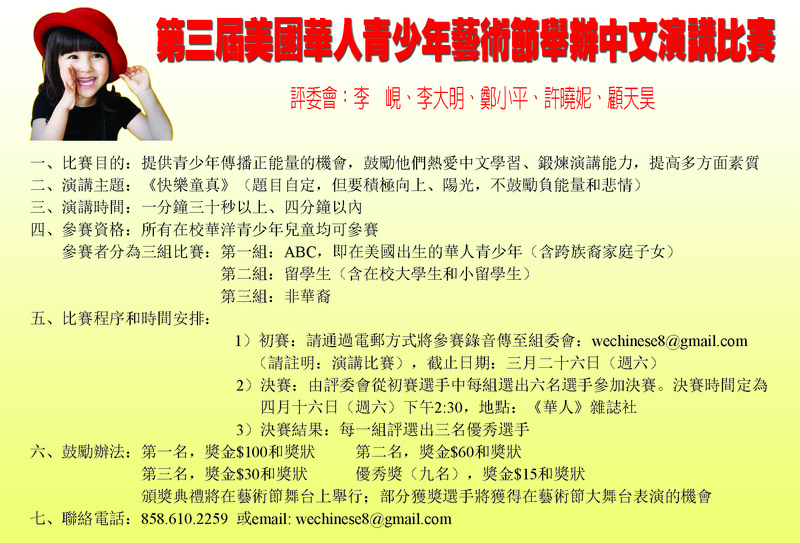 Practice your Chinese writing skills and get recognized! I know you can do it! Application is attached here again. 5) inGenius Summer Camp Open House is on March 26. Please refer to the attached flyer for details. 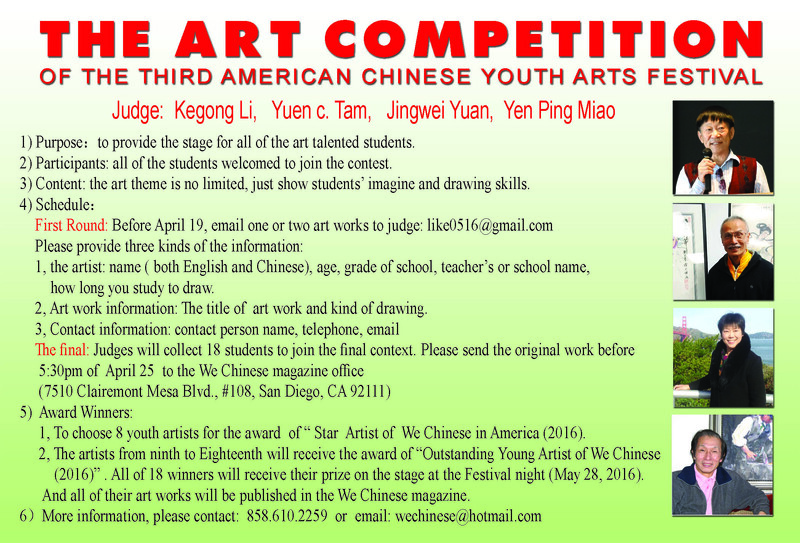 6) The 3rd American Chinese Youth Art Festival is calling on submissions for Speech Contest (deadline 3/26) and Art Contest (deadline 4/19). Students, your talent is precious, and there is no better way than present it in the spotlight! Please refer to the attached flyer for details. 7) No food in classroom! Teachers, please pay special attention to this policy. Enjoy the beautiful sunshine, and I shall see you all on Sunday!